Barely a month into the new Trump era, Americans are beginning to sour on President Donald Trump and the Republican-controlled Congress as the wheels begin to come off the GOP drive to repeal and replace the Affordable Care Act. Voter displeasure with some GOP policies, particularly the effort to dismantle Obamacare instead of finding ways to improve it, have been welling up during town hall meetings held by Republican House and Senate members during a week-long congressional recess. And there are indications that the White House may renege on Trump’s repeated pledge to unveil a comprehensive new health insurance plan sometime in the next few weeks. New surveys suggest that Trump’s approval rating, historically low at the start of his first term in office, continues to plummet while voters fear the country is on the wrong track. They are questioning whether congressional leaders including House Speaker Paul Ryan (R-WI) and Senate Majority Leader Mitch McConnell (R-KY) can make good on their party’s top promises, including replacing Obamacare with a new conservative approach, overhauling the federal tax code, and bringing more jobs back from overseas. Although most surveys show Trump in the low to mid 40s, a Quinnipiac University survey released on Wednesday found that 55 percent of Americans disapprove of Trump’s job performance compared with only 38 percent who approve of it. This 17-point gap in public approval of Trump is the widest since he took office in mid-January. Several other new polls find a smaller disparity, ranging from five points to 10 points. 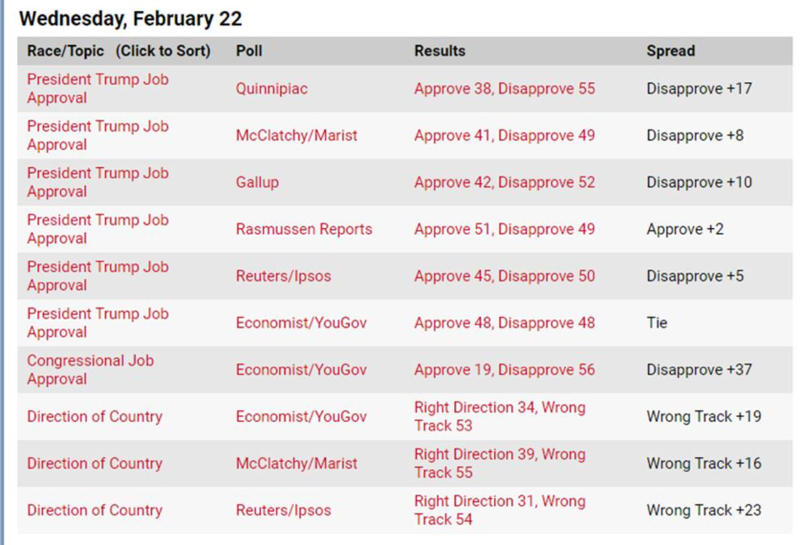 A new YouGov/ Economist poll found that 56 percent of Americans disapprove of the job Congress is doing, compared to 19 percent who approve of what’s going on in Washington, while 53 percent say the country is going in the wrong direction. Related: Are Republicans Losing Momentum on Obamacare Repeal? At the same time, voter sentiment about the long-troubled Obamacare program continues to improve – with many more interested in seeing Congress fix the problems that are driving up premiums and driving insurers out of the market instead of dismantling a program that has insured more than 20 million Americans. A new Morning Consult/Politico poll found that 51 percent of voters still support repealing Obamacare – with far more Republicans than Democrats taking that stand. But that is down from 58 percent at the beginning of the year, before it became painfully obvious that Trump and the congressional Republicans have been unable to agree on a replacement plan that could pass muster with a majority of lawmakers and key health care interests and consumers. Armed by their leaders with only vague talking points of what a GOP replacement plan might look like, GOP lawmakers are being hammered by constituents from both parties at recent town hall meetings across the country. The latest victim was Sen. Tom Cotton of Arkansas, a rising star in his party, who was grilled for nearly two hours last night by many of the 2,000 angry constituents who packed an auditorium in Springdale, Ark. Some told Cotton that they were alive today thanks to their Obamacare coverage and demanded to know what he and the Republicans intended to go to continue providing coverage to millions of Americans, especially those with serious pre-existing health problems. One woman said her husband is dying and challenged Cotton to sit down with her and her family to learn about their experiences, according to the Huffington Post. Trump and other GOP leaders have been pooh-poohing the large turnout of protesters at recent town hall events, suggesting that they were mostly paid agitators put up by the Democrats and liberal political action groups. But it’s likely that the protests that have been garnering widespread media attention have Republican leaders rattled. Trump has long promised to repeal Obamacare and replace it with a plan that would provide better and less expensive health insurance and repeatedly promised last month to unveil a “fabulous” plan shortly after his new health and human services secretary, Tom Price, was confirmed by the Senate. But whether Trump has been simply lying until now or is beginning to get cold feet amid signs the “repeal and replace” movement is imploding, the administration just sent a message that Trump may be pulling back and leaving the heavy political lift to Ryan, McConnell and other Republican congressional leaders. In fairness, former President Barack Obama encouraged Democratic leaders, including then-Senate Finance Committee Chair Max Baucus, to take the lead in drafting the Affordable Care Act legislation in 2009. But Trump has led everyone to expect that his new administration would provide a solid framework for the scores of ideas that have been circulated by House and Senate lawmakers for months. Without Trump getting behind a plan and vigorously pushing for its passage, the GOP drive to complete action on a budget reconciliation package to repeal and replace Obamacare this spring could collapse of its own weight.